Since I didn’t post last week, I have lots of news! First things first. 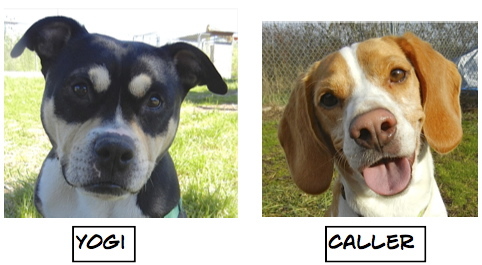 Here are the latest Blog Dog adoptions. 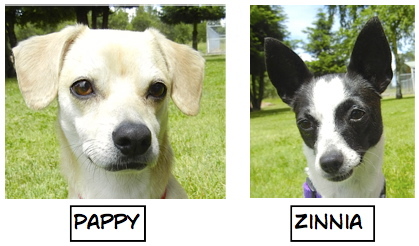 And…I’m very excited to be able to report that a pair of bonded dogs went home together! Here they are. 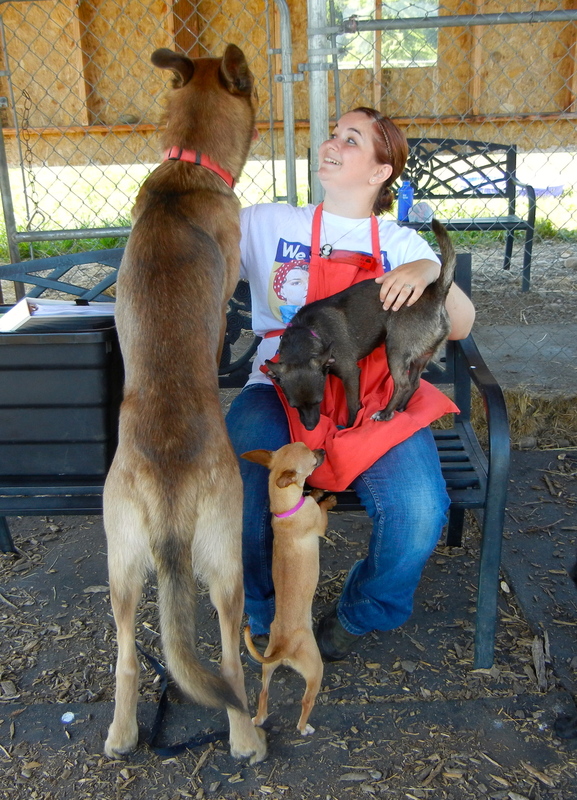 Sunday’s play group was another fun one for both big and little dogs, as you can see here. 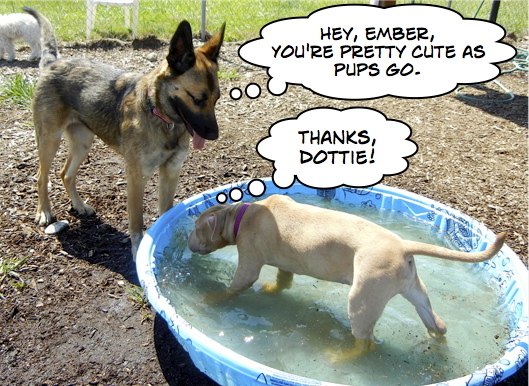 Little Ember discovered how much fun it was to get into a pool, while Dottie kept an eye out for the little tyke. Choji, the fastest runner in the group, decided it was time for a rest. I love her ears! If you ever worry about the next generation, rest easy. As long as there are kids like Jadzia, we’re in good hands! On Sunday while Sarah was helping me take pictures of the new dog arrivals, she noticed a little girl and her mother looking at the adoptable dogs. It turned out it was Jadzia’s birthday and instead of getting presents for herself, she had asked her family to donate money to our shelter for the dogs and cats! So her mother had brought her to WHS to see where her money would be going. I asked if I could take her picture for my blog, and her mother said yes. What a wonderful little girl! I have a feeling she’ll be volunteering at WHS in a few years. 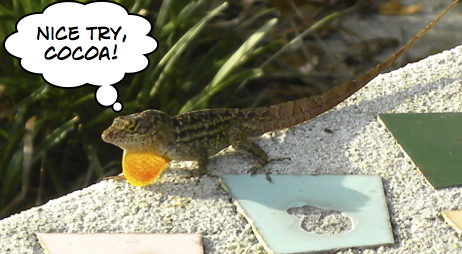 My thanks to you for making Jadzia feel like such a superstar! I was able to talk directly with Sarah (in Donations) this morning, and pass along my feelings about what a unique and positive experience we both had there yesterday. Both as a mom and a business person, I can tell you the methods employed yesterday by all staff and volunteers were impeccable! I have delightedly shared the story with numerous friends and coworkers, and will encourage anyone who can to get involved. Thanks so much for your role in helping my daughter become a devotee to philanthropy. While I’m waiting for my new family to discover me, I’ve been hanging out at Beth’s house! News Flash! I just got word yesterday that Hailey is being transferred to Second Chance Salem, a new rescue started by one of our very own WHS dog walkers, Angie! 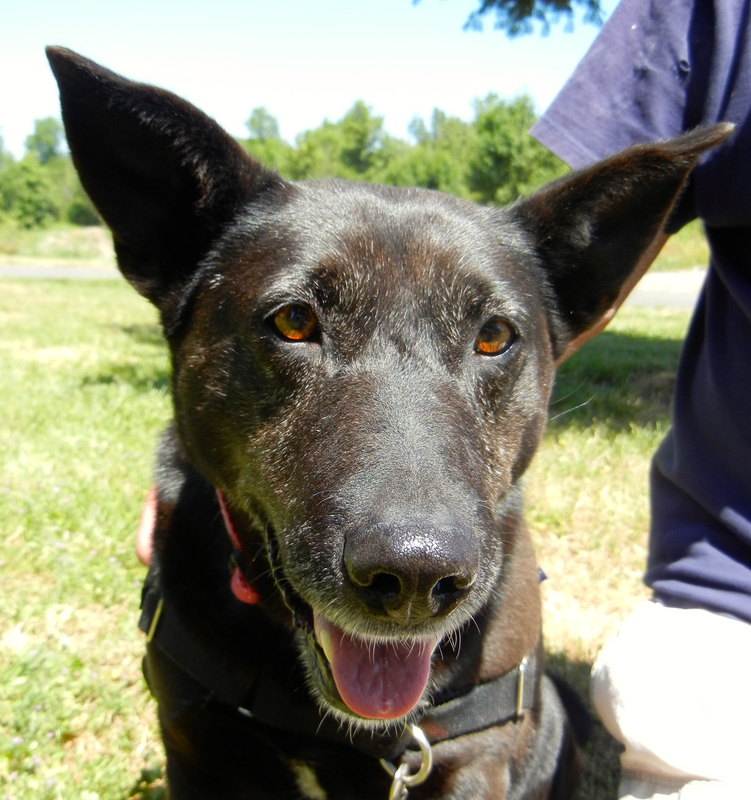 So Hailey will be in a home while waiting for a new family to adopt her! 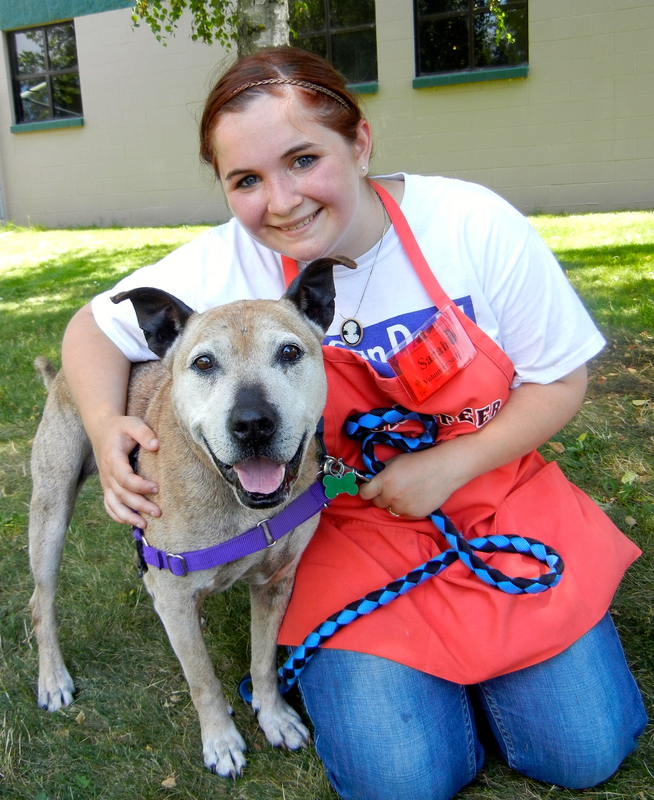 In the last several weeks, WHS has been receiving quite a few senior dogs. So I decided that I would feature these older-but-wiser gentle souls in this post. While it is no surprise that puppies are adopted quickly from shelters, thank goodness there are people who realize the value of seniors. 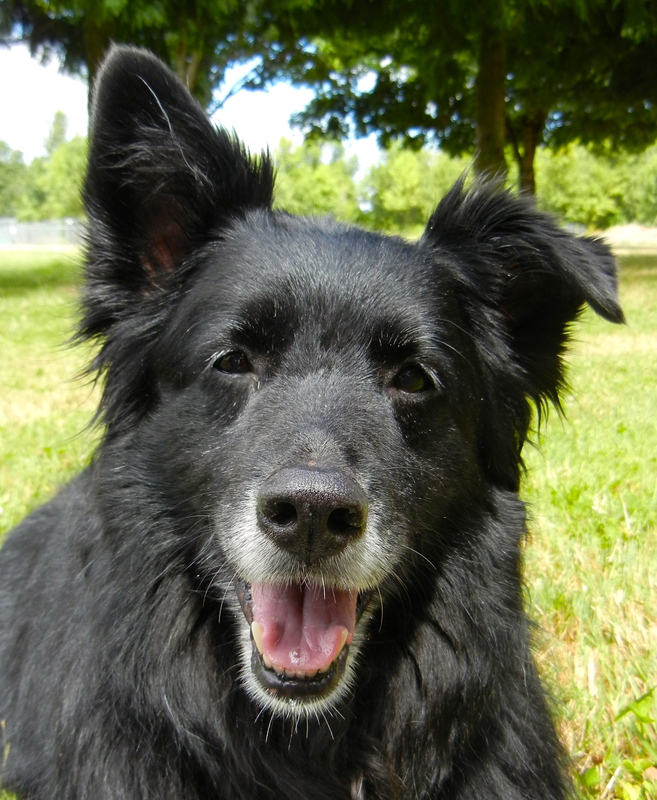 Why should you consider adopting a senior dog? 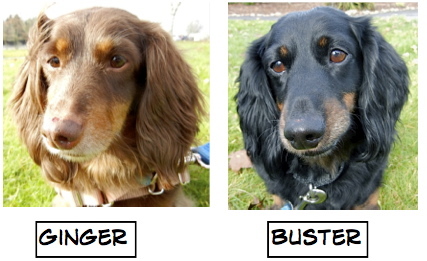 According to the “Senior Dogs Project” (srdogs.com) here are some of the reasons (in my own words). 1. 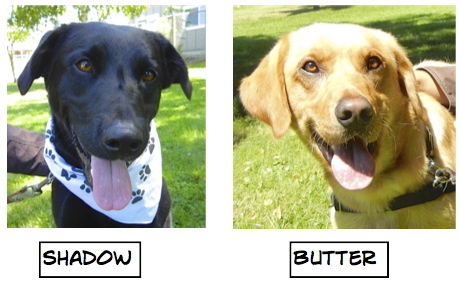 They are already housetrained. 2. They can focus well, so they can learn quickly. 3. They settle in more easily, they know what a family is. 4. What you see is what you get. Their personalities are set. 5. They leave you time for yourself, they like to sleep. 6. They are content with less activity. There’s nothing like an old dog. Nothing like the love of an old dog. The forgiveness, the devotion. You see gratitude in their eyes. It’s just words until you experience it. 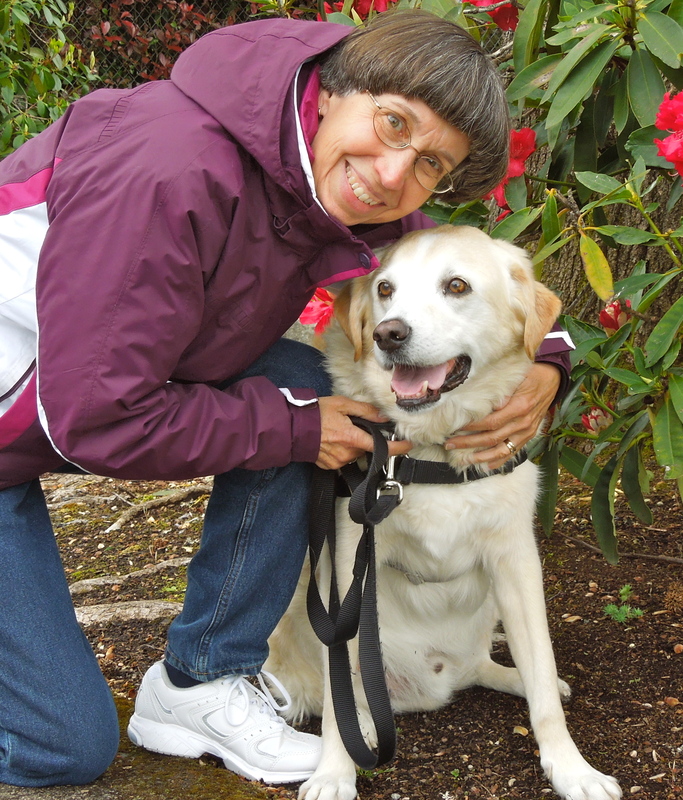 In case you need proof that I know what I’m talking about, here is a picture of my eleven-year-old Lab mix, Scout, and me. 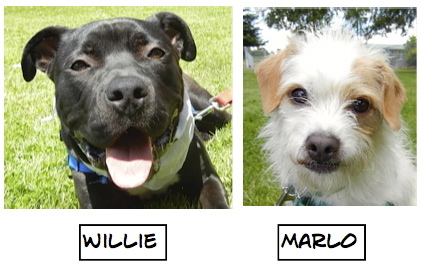 Now here are some of the senior dogs currently at WHS waiting for their forever homes. 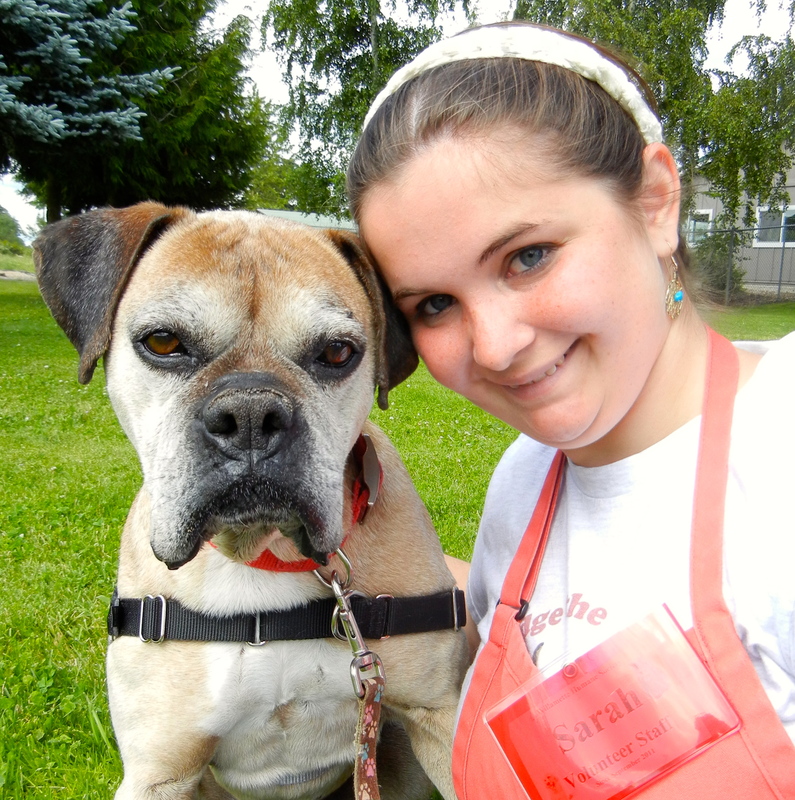 Rebel is a twelve-year-old Boxer mix who is one of Sarah’s current favorites. He is gentle, calm, enjoys walks, and still has a spring in his step that belies his age. Rebel is a gem. Although he is a serious-looking fellow, his tail speaks volumes. 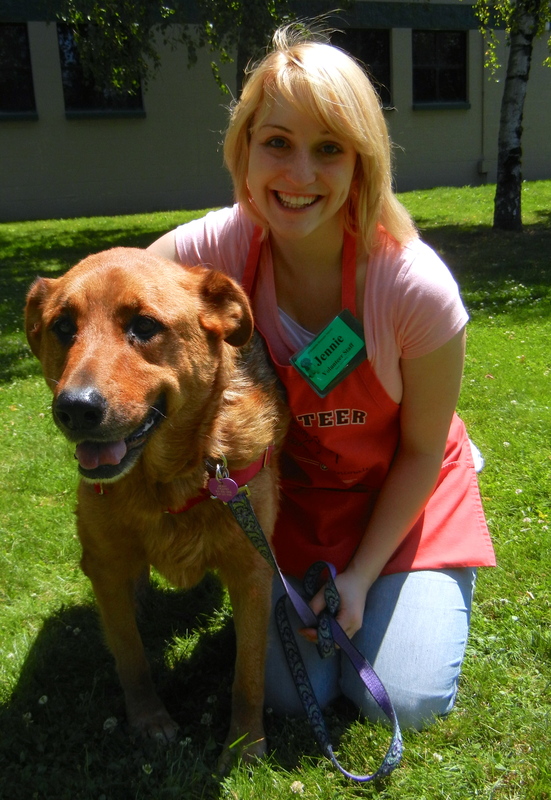 Here is Molly with volunteer Jennie. 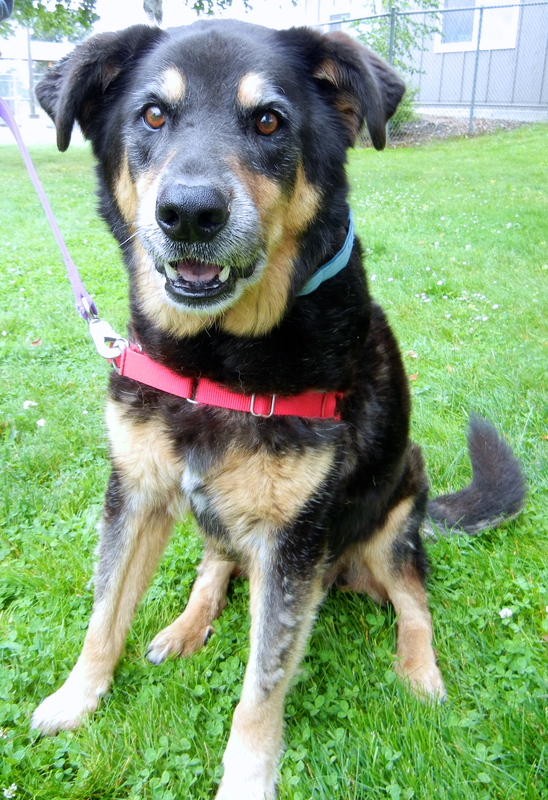 Molly is a ten-year-old Shepherd mix. She enjoys slow walks and lots of relaxing time. She needs to go home with adults or older children, as her frisky days with little kids are over. She’s an uncomplicated dog who will most enjoy lying at your feet while you read a book or watch TV. 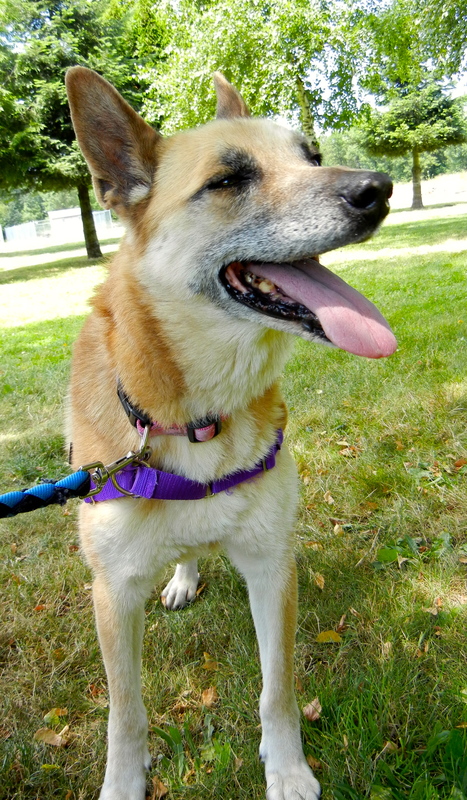 Amber is a twelve-year-old German Shepherd mix hoping for a family who wants to hang out with her in quiet relaxation. She loves attention and conversation. She will make a wonderful companion. 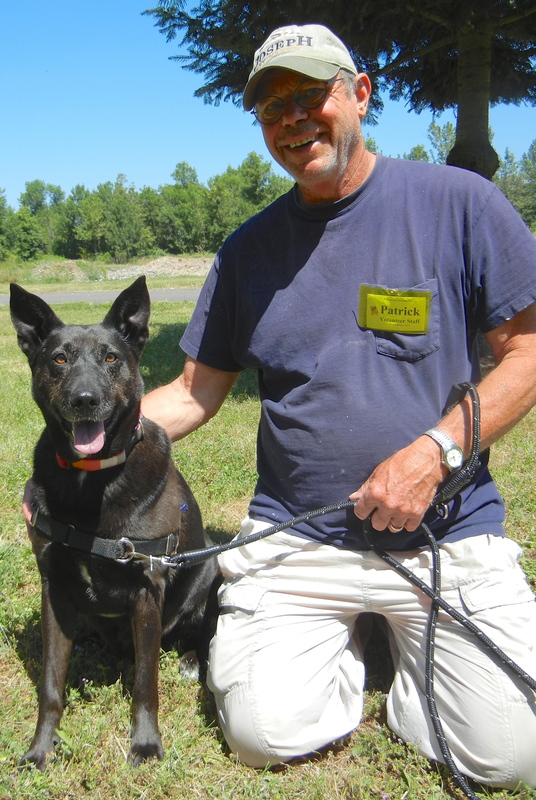 Journey is a ten-year-old Shepherd/Alaskan Husky mix. 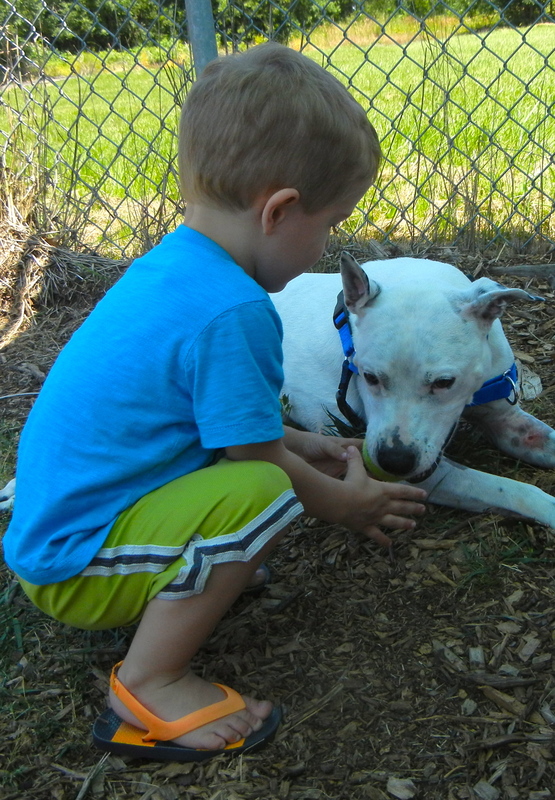 He gets along well with other dogs and even kids; however, he should not be around little kids who would jump on him, as they could hurt his joints. 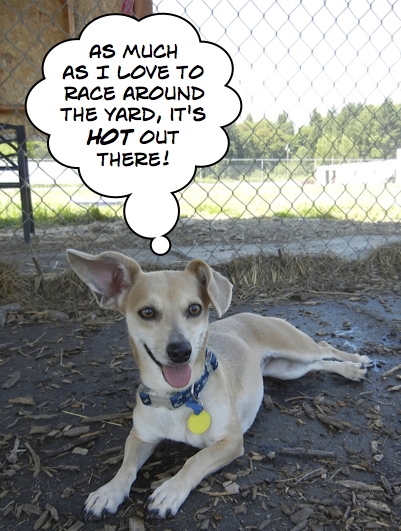 He enjoys meandering around the yard during play group, though is racing days are in the past. 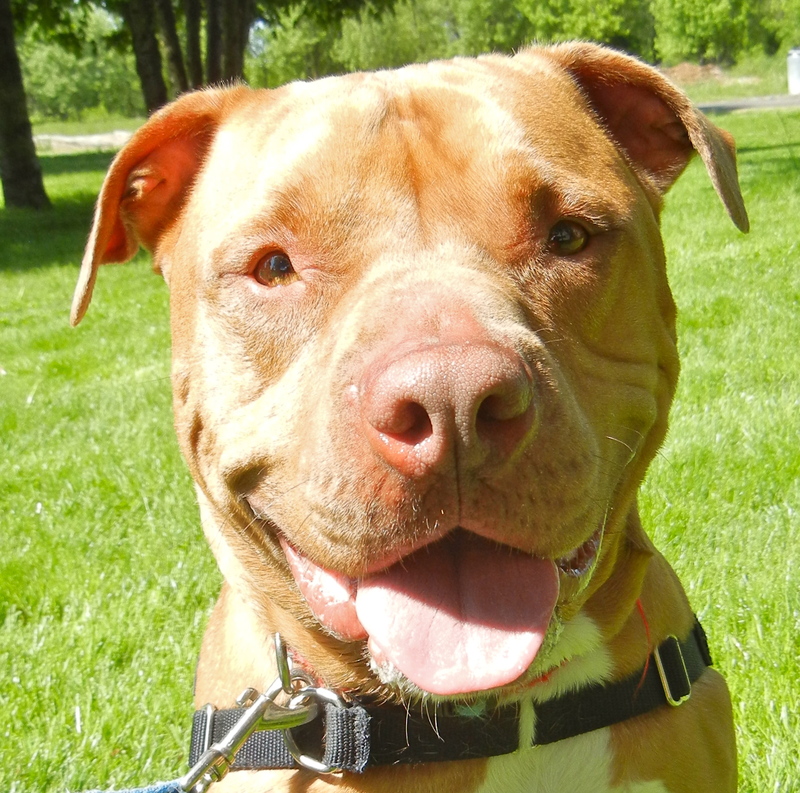 Journey is a happy boy looking for a laid-back home where naps are totally acceptable. Meet Biscuit, a happy-go-lucky ten-year-old Bull Terrier/Chinese Shar-Pei mix. And yes, she’s another one of Sarah’s current favorites. While a little shy at first, Biscuit is quick to warm up and loves hanging out. I have to smile every time I see her eager face. 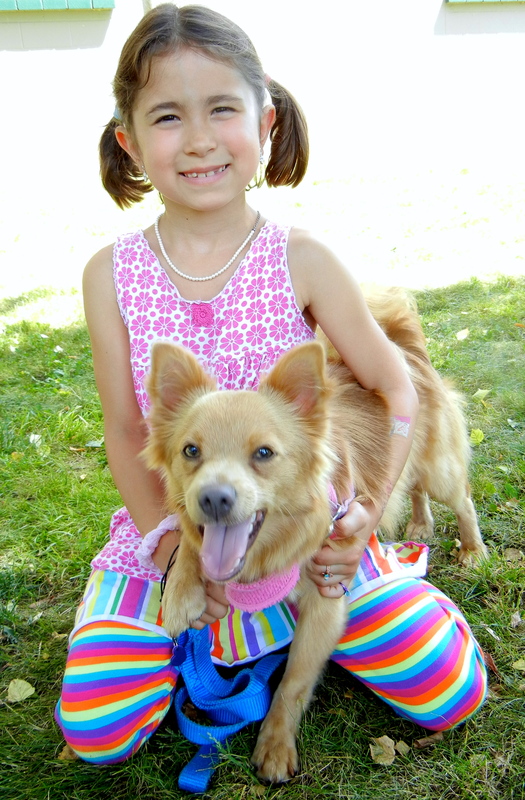 I first met eleven-year-old Daphney on Sunday. She had arrived at the shelter a little while before and was feeling nervous and confused. 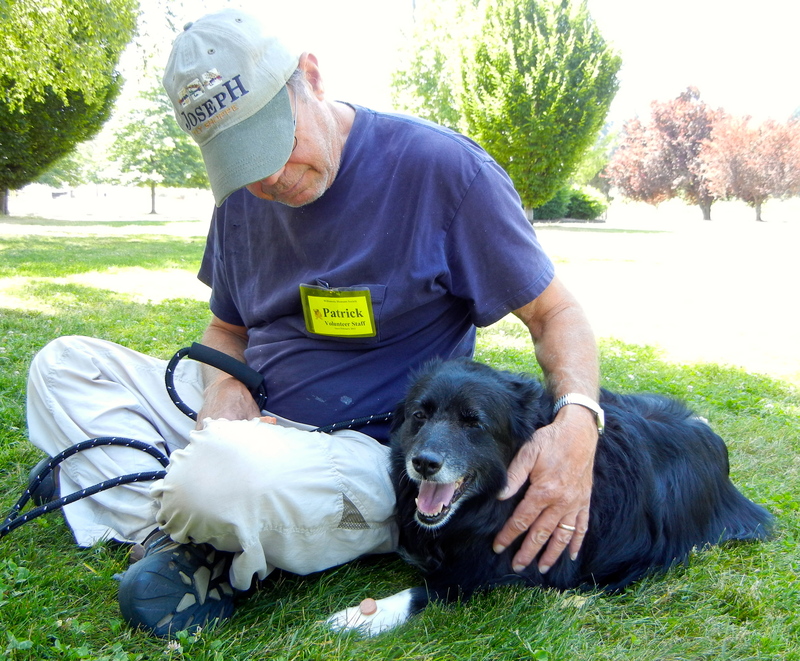 Today she was still a little shy and unsure, but volunteer Patrick, who has a special love for shy dogs, spent a long, quiet time with her out on the lawn. She really enjoyed snuggling next to him. She is a sweetheart and would love calm, understanding people. Don’t even ask…I have no idea where her name came from, but she is wonderful. She is another shy one, so once again Patrick gave her some quality time today out in the big yard. He came back beaming, saying that she LOVES to play ball and will race after it and return it to you. 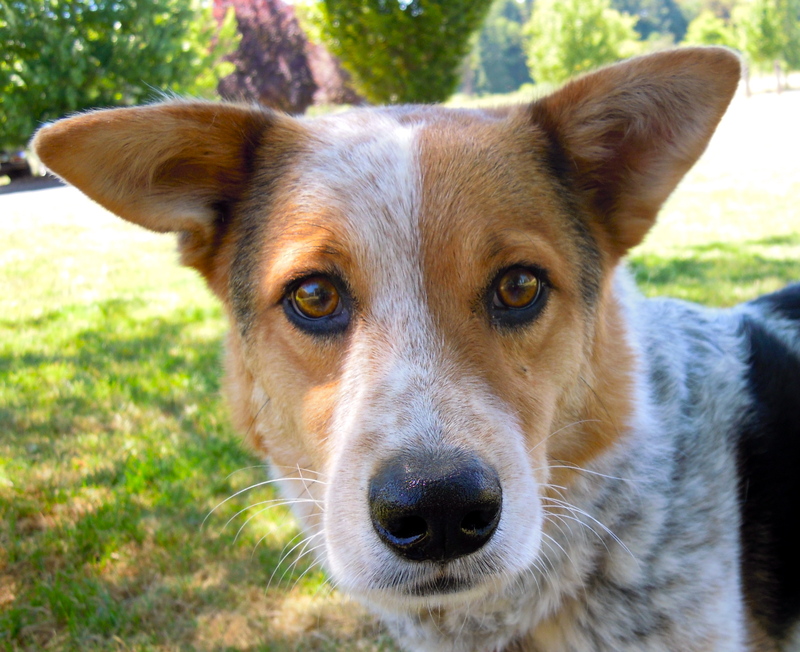 She is an eight-year-old Australian Cattle Dog mix. I love her smile. If you are a regular reader of my blog, you know that I love to get updates from adopters about their WHS alumni. I’m happy to report that I have received several happy emails lately. 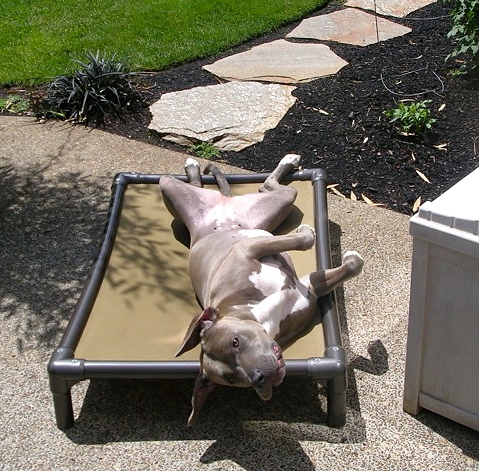 First, I got a kick out of Ruby’s people sending this shot of her enjoying the summer sun. It seems Ruby loves nothing more than stretching out and soaking in rays! Is she relaxed or what!? This update was posted on my WHS Facebook page. Hoggie (now Danner) went to the BEST forever home! His new mom is a close friend of mine who has fallen in love with him.. and brags about him (how can you not??) He loves his car rides and meeting new people and gets plenty of toys and loves. Thank you WHS! I got this email with this picture attached from Sage’s person. Long-term readers may remember Cooper. Cooper came into our lives early August 2010. 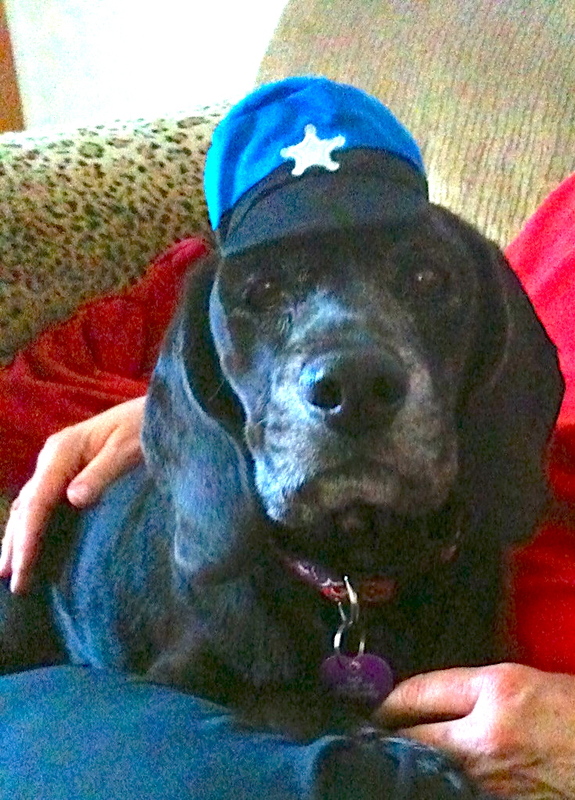 We had recently lost our two beloved 14 yr old companion dogs within a two month period of time. My husband, Larry, and I and our Sheltie, Boots, were grieving. 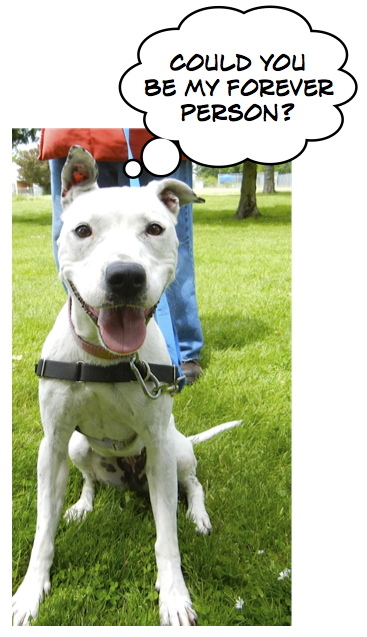 I looked online at the Willamette Humane Society Website and saw Cooper for the first time. Something about his face reminded me so much of Henri, our Australian Shepherd who had recently passed. The next day we went to the shelter and brought Boots with us to check out Cooper. Although my husband and I fell in love immediately with the very shy blue heeler mix; Boots did not feel quite the same way. We decided to adopt Cooper and took him home with us that very same day. With time he and Boots became great buddies. 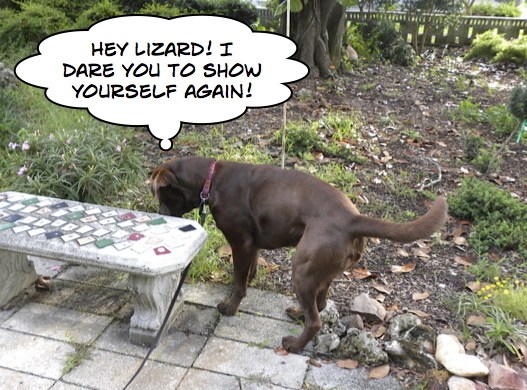 We simply can’t imagine our lives without Cooper and his quirky ways! 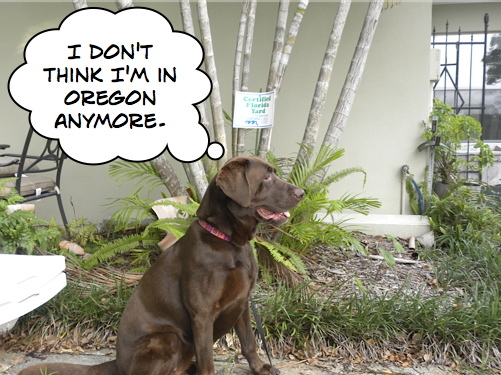 And finally, remember that Cocoa was moving with her family to Florida? She is now settling into her new surroundings and sent me these pictures. They speak for themselves.